Ascot Racecourse staged a media event aboard R S Hispaniola on London’s Victoria Embankment ahead of the 2018 Dubai Duty Free Shergar Cup, staged at Ascot this Saturday, August 11. The Dubai Duty Free Shergar Cup is the world’s premier jockeys’ competition, a unique event where three top riders in each of four teams – Great Britain & Ireland, Europe, Rest of the World and The Girls – battle against each other in a thrilling six-race showdown. Australian star rider Corey Brown, involved in the Dubai Duty Free Shergar Cup at Ascot on Saturday for the first time, is part of a powerful Rest Of The World team which also consists of Japanese ace Yutaka Take and Brazilian ‘Magic Man’ Joao Moreira. Brown is best known to this side of the world for partnering the Joseph O’Brien-trained Irish raider Rekindling to win the 2017 G1 Melbourne Cup at Flemington in November, the race that stops Australia, at the age of 41. This was his second Melbourne Cup success, following on from Shocking in 2009. He is an immensely experienced jockey, who has ridden all over the world, but his knowledge of British racing has been limited to two rides – one way back in 1995 and the other at Ascot in 2015. The latter mount was in the six-furlong G1 QIPCO British Champions Sprint Stakes at Ascot, in which he finished a respectable seventh of 20 on the 33/1 chance and Singapore-trained Emperor Max behind Muhaarar. His manager/agent Paul Webster picked out Rekindling as the right sort of ride in last year’s Melbourne Cup, one of the few two-mile races in Australia, and Brown was booked three weeks ahead of time. Brown explained: “I was booked last night. My manager picked Magic Circle out a couple of months ago and we have been watching replays of his wins. “I thought he may have been a little bit hasty in taking the ride as early as he has, but the horse’s form is pretty good. I like what I have seen on the replays and the horse will get in with no weight on his back. “My manager Paul grew up in England as a young lad and he still remains in contact with the English and European form. Heading into the Melbourne Cup, we are always scouting the European form and seeing if there are any horses coming over because your staying form over longer distances is much better than ours in Australia. He explained: “I think I have got quite a rapport with the overseas trainers, especially with the lighter-weighted horses. I can ride at any weight they want me to. I have developed quite a CV in the longer races. “We do not have a lot of long racing, but I do prefer to ride over longer distances -2,000 metres (10 furlongs) and beyond. He is well versed in jockeys’ competitions, having taken part in events in Australia, Dubai, France, Hong Kong, Macau, Mauritius and South Africa, though the Dubai Duty Free Shergar cup is unique in being a team event, with the Rest Of The World taking on three-strong teams from Europe, Great Britain & Ireland and The Girls. Brown remarked “I love jockeys’ competitions. I’m really looking forward to riding in the Dubai Duty Free Shergar Cup and then will be participating in another one at the end of September in Singapore. “I’ve been trying to ride in the Shergar Cup for many years now and I finally met the right people to get myself on the team. I’m looking forward to the weekend and hopefully I can draw a nice few horses. I think our team is very strong. “I’ve ridden with Joao Moreira and Yutaka Take on numerous occasions. If you look at both of their CVs, they have some special victories in big races and lots of wins under their belts, so it’s great to ride with them. I have never seen a jockey in all my years to hold his form at such a high level like Joao – he has broken records consistently for the last eight to 10 years, while Yutaka is a superstar and an idol in Japan. Our team has plenty of depth in it. “It’s a big plus that they have also both ridden at the track before, so it’s really exciting to be competing in the same team as these guys. “I think team events and jockey challenges are a great idea. It’s hard when you are competing by yourself. In a team event, you might not be near the front in a race and you can be cheering on your team-mate who might be in the lead, so it brings a real togetherness and a real team mentality to racing. The Shergar Cup is a great concept and it definitely works. “It has been unbelievable – I think I rode six G1s in the first 12 months back. I struggled to find a spot for week-in, week-out riding as I had been away so long and all the young guns are very keen and eager, but as far as the big races went I had a great run. “Apart from a couple years with Lee Freedman in Melbourne, Sydney has always been home in Australia. Melbourne involves a lot of travel – many hours spent in the car because the tracks are so wide apart, while Sydney is quite tight – never more than two hours’ drive so it is a fair bit easier. He explained: “I would like to do a few months here one time – have a bit of a go for experience and self-satisfaction. I want to continue riding at my present level until the end of my career. I would love to win a Cox Plate or an international G1, but I am quietly satisfied and happy with what I have done up to date. “It has just been mine and my wife’s (Kylie) 21st wedding anniversary so we decided to take some holiday around this trip to England – we have been to Spain, the South of France and Greece. “I am a little bit soft – not 100 per cent fit, but near enough. I have been trying to run every second day – we walked to Windsor Castle from our hotel yesterday – about 12 kilometres. I ride week in week out at 53 or 54 kilos, but both my Melbourne Cup winners had 51 kilos so I ca get down to 50 or 50 and a half with a bit of notice. “To win two Melbourne Cups was very special. The victory on Shocking was a huge relief as I had been narrowly beaten (by a nose) on Bauer (trained by Luca Cumani) the year before (2008) when finishing second. That ticked a big box. “In 2017, I think Rekindling was arguably more special, as I had my three daughters for the first time and my wife down there to enjoy it. It is one thing to experience what I feel and how special it was for me personally to win the race, but to have my family watch me win was really special. Those two wins are some of the biggest achievements of my career. “I was drawn in stall four aboard Rekindling in the Melbourne Cup and I had a great trip round. I didn’t use up too much petrol in the early stages of the race and turning for home, he was travelling really well. I pulled him out from the leading bunch in the home straight and I was really confident with the way the horse was running. “Rekindling had done no work mid-race and watching his past videos, I knew he was going to quicken up when I asked him to kick. I was very confident in the home straight. “Winning the Melbourne Cup is huge in Australia. Years ago it was the race that stopped Australia – now it has become a massive worldwide event with huge media exposure, even in America. It has definitely become a world event. “I definitely think I am getting much more quality rides now compared to when I first got home in 2016. Winning on Rekindling helped in a very competitive riding environment. Per-Anders Graberg from Sweden is relishing his first trip to Ascot on Saturday for the Dubai Duty Free Shergar Cup, where he will form part of the Europe team. Graberg, who is based at Bro Park in Sweden and has won the G3 Stockholm Cup a record five times, said: “I have watched lots of big races run at Ascot on television. I will walk the track today and tomorrow, and am very much looking forward to the Dubai Duty Free Shergar Cup on Saturday. “I had a couple of rides at Lingfield around 10 years ago, for a trainer from back home. “Bro Park is getting better and better as time goes on. There was some problems at the beginning, especially with the dirt track, but it is going the right way now. “Probably around 70 per cent of racing in Scandinavia is on the all-weather or sand. We don’t have any G1 or G2 races – the highest level we have is G3. We have racing four or five times a week. Probably our biggest race is the G3 Stockholm Cup, which I have been fortunate enough to win five times. “The gambling market is quite strong and the prize money is actually pretty good in Sweden. The issue going forward is when the gambling market is opened up. We don’t know if this will be good or bad for us yet. At the moment, money comes into racing through a lot of betting on trotting and we just don’t know how this will affect us going forward. However, racing is going well at the moment and there is also talk of new tracks opening near Stockholm and at Malmo in the south, which will be great for the game. “I have had the chance to ride for Benny Anderson from Abba. He is a really nice guy and also a big sponsor of Swedish racing, including last Sunday’s Lady Jockeys’ Thoroughbred World Championship at Bro Park. “I have also had the chance to ride in the Middle East, including at Meydan where I ride for a trainer from back home Niels Petersen. It is tough to ride there, as most trainers have their own jockeys but it is great experience to go out there and ride against some of the best jockeys in the world. “I have ridden in jockey competitions before, but never at a team event like the Dubai Duty Free Shergar Cup. It is something totally different. “Even if I get a ride with not a great chance of winning, at least I can try and help my teammates and we can hopefully do well together. This event seems like a fun day at the races, where people will be more relaxed and have the chance to lighten up a bit. For us jockeys, we are riding every day on our own so to have the team concept is something interesting. Starke said today: “Every jockey around the world knows about Ascot, the Royal Meeting and the King George. It is one of the top racecourses in England. “To win the King George with Danedream in 2012 by a nose was so special. I didn’t know I had won crossing the line as it was so close. The emotion of winning that race was unbelievable. There is nothing better than getting your prize from The Queen. “Ascot is a very fair track, the best horse usually wins. It is a strong track and if you are own a strong horse, they have a good chance of winning. “I enjoy the Shergar Cup. I have ridden in lots of these jockey competitions around the world in Japan, Hong Kong, South Africa and America. I like to ride in a team environment as it makes it more competitive, but also more fun. 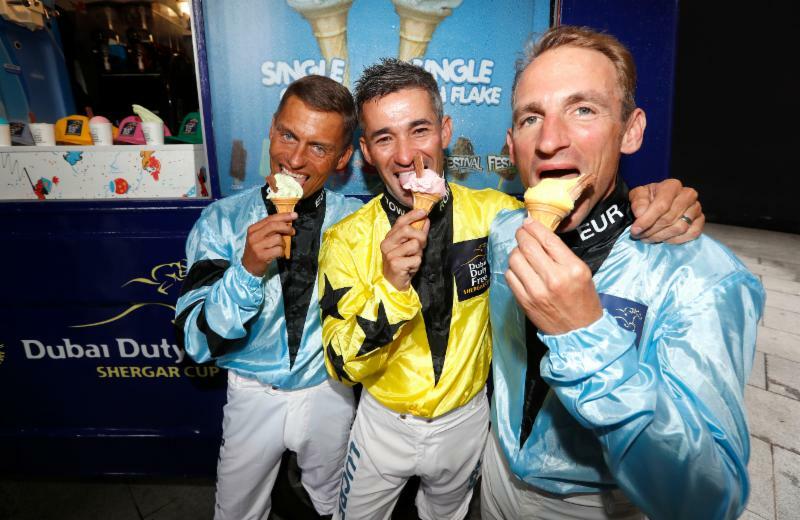 The Shergar Cup gets all of the top jockeys around the world to take part and I really enjoy it. “Usually I fly in on the morning of the Shergar Cup, but this year, I am here two days before so it is more fun and I get to experience everything. It is nice to come here a couple of days before and enjoy coming to England. It’s nice to talk to the other jockeys. “I have ridden in the Shergar Cup before with Gerald Mosse. He was captain in 2013 and I know Per-Anders Graberg very well having ridden myself in Scandinavia a few times. Per will have no problem with the track at Ascot as Scandinavian tracks are quite similar. I’m very happy with my team. “I think I’m getting old if I have been given the captaincy! Our combined age together is well over 100! Gerald Mosse is a great jockey and has won everywhere around the world and is 51. “I still love riding. I’m not worried about whether we win – we are just here to enjoy it. Germany is a small horse-racing industry. We have a lot of good horses winning overseas in the past, but it is perhaps not as popular as other sports in Germany. We try our best in Germany and we have been lucky to have some good horses over the years. “We have some lovely meetings in Germany including at Baden-Baden which is a beautiful track. It is surrounded by so many mountains and it has a great atmosphere there. “I love coming to England which is a real horse country. The meetings you have here are so wonderful. “To win the Prix de L’Arc de Triomphe and a King George on Danedream was very special. For a German horse, I think it is harder to win a King George than an Arc as Ascot is such a tough track and as a filly, the weight allowance for the King George is not as much as it is in the Arc. “A four-year-old filly to beat the colts in the King George was a magnificent performance. Danedream never gave you a special feeling in her trackwork and we went to England thinking if she was placed that would have been a good effort. For 3yo+, rated 86-105 (also open to such horses rated 85 and below). Lowest weight: 4-y-o and up 8st 9lb; 3-y-o 8st 6lb. Highest weight: 4-y-o and up 10st; 3-y-o 9st 11lb. Penalties, after August 4, 2018, for each race won 3lb. For 4yo+, rated 81-100 (also open to such horses rated 80 and below). Lowest weight 8st 9lb; highest weight 10st. Penalties, after August 4, 2018, for each race won 3lb. For 4yo+, rated 76-95 (also open to such horses rated 96 and 97; such horses rated 75 and below are also eligible). Lowest weight 8st 9lb; highest weight 10st. Penalties, after August 4, 2018, for each race won 3lb. For 3yo, rated 76-95 (also open to such horses rated 96 and 97; such horses rated 75 and below are also eligible). Lowest weight 8st 9lb; highest weight 10st. Penalties, after August 4, 2018, for each race won 3lb. For 3yo, rated 81-100 (also open to such horses rated 80 and below). Lowest weight 8st 9lb; highest weight 10st. Penalties, after August 4, 2018, for each race won 3lb.